You’re damned if you do and you’re damned if you don’t sometimes, when a journalist calls with an awkward question. This is the dilemma Microsoft faced after the publication of a report that illustrated what vast money it was making out of local government in the UK. Local government bodies spent £109.4m on Microsoft software in the year to April 2013, according to a report by research firm Kable. Roughly 90 per cent of that came from sales of its Office suite of productivity applications. Kable’s ‘Pelagic Quadrant’ of local government software spending put Microsoft way out in a league of its own. The ‘Productivity and Other’ sector where Microsoft dominated was the single largest software sector in local government. It was also the least competitive. Microsoft had fewer competitors than anyone else > and it made more money than anyone else. It didn’t take a marine scientist to work it out: the market had failed. It may be true that there are a few big ugly fish in local government software. Some of them smell like bottom feeders. But Microsoft is the Gorgon. Its great, mucous scaled thighs and hefting fishy groin straddle 80 per cent of ‘productivity and other’ software sales in local government. If you strip out the ‘other’, you strip out things like security software from Symantec and McAfee who -!- after Microsoft’s £97.9m of productivity software sales -!- have the next largest market shares at just £7m and £5m each. Strip out the rest of the ‘other’ and stick with productivity and you are left with just Microsoft. So when Microsoft got a call from Computer Weekly about this, there was only one way it was going to turn out. The point of the call was this. When you read a report on the local government applications market by a firm like Kable you come to the exercise with certain pre-conceptions. Chief of these is the expectation that ugly beasts like Capita, Civica and Northgate will top the league tables. Local government business revolves around big, transactional operations like the administration of benefits and the operation of telephone call centres. You might expect suppliers of systems that administer these things – suppliers such as Capita – were mopping up in local government software. They are, actually. And they do top the leagure tables in their fields. But Microsoft tops them all. Microsoft, the firm who were it not for its immense wealth and power, you might reasonably dismiss as that bunch who just make bloated, over-priced word processors. It is a surprise to see Microsoft dominating local government software. It is unsettling to see it do so with word processors and other common-or-garden desktop applications. So Computer Weekly asked Microsoft: doesn’t Kable’s ‘Pelagic Quadrant’ illustrate how the market has failed? And here we get to Microsoft’s dilemma. If it says, ‘Yes the market has failed and we’re the culprits who drained local government of every drop of public money that might have been more gainfully spent tending the weak and aiding the meek’, then it would be effectively abdicating its monstrous throne. If it said, ‘No, the market has not failed and we make great software that does great things for our customers’, then it smells like fish breath. Either way it’s in for a tabloid pasting. It turns out that Microsoft has fish breath. “This is a competitive market,” said a Microsoft spokesman in a written statement. “Arguably, local Government has more choices than ever before for its business productivity software. “We don’t accept there is market failure,” he said. It did not alas have any evidence to contradict Kable’s findings and the tuppenny economic conclusions we might draw from them. Microsoft might have theoretically strong competition from open source office packages like Libre Office and first-move cloud upstarts like Google Docs. The market might be fragmenting. But the only real competition for Microsoft is from free software. The market is so soundly possessed by Microsoft that competitors can’t get noticed unless they give it away. This creates a problem for a firm like Kable. 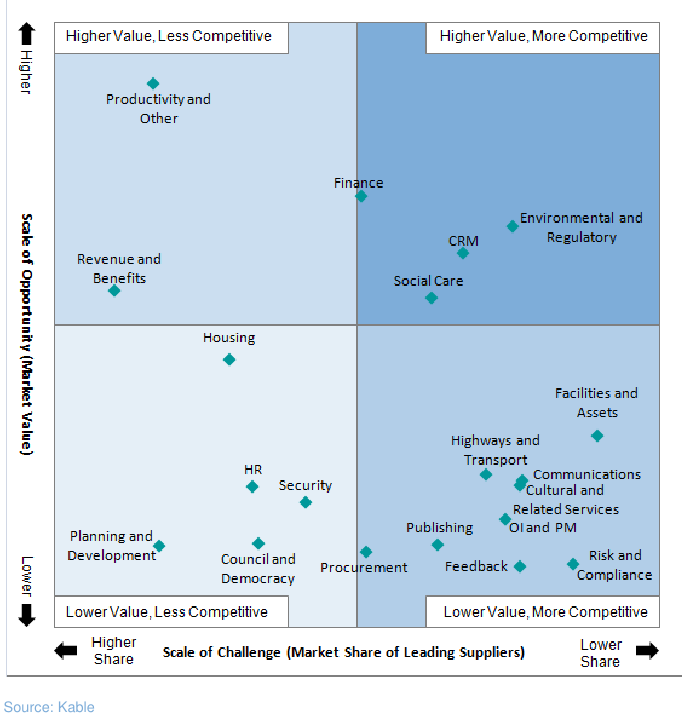 It’s report – “Competition and Complexity, An Overview of the Local Government Applications Market” – measured Microsoft’s leading position by its software sales. Open source office installations don’t reckon in these numbers since they don’t involve anyone selling any software. You can only measure Microsoft’s true dominance if you count the number of workstation seats where it is installed. Microsoft refuses to say how many seats it has in local government. So when nobby numb-nuts local government CIO opens his Kable report all he sees is Microsoft. The Neanderthal mind equates big with clever. And thus the market research firms help perpetuate the monopoly. We are all but helpless bystanders. Or miserable sinners.